Alireza Khaligh (ECE/ISR) has been promoted to the rank of associate professor with tenure by University of Maryland President Wallace Loh, effective July 1, 2015. Khaligh directs the Power Electronics, Energy Harvesting and Renewable Energies Laboratory (PEHREL). His major research interests include modeling, analysis, design, and control of power electronic converters. He is an author/co-author of more than 120 journal and conference papers as well as two books including Energy Harvesting: Solar, Wind, and Ocean Energy Conversion Systems (CRC Press, Dec. 2009), and Integrated Power Electronics Converters and Digital Control (CRC Press, May 2009). 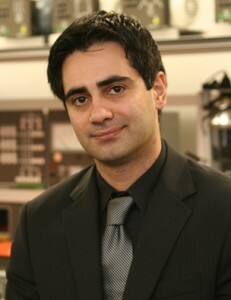 Khaligh has received the 2013 George Corcoran Memorial Award from the ECE Department of UMCP, 2013 Best Vehicular Electronics Awards from IEEE Vehicular Electronics Society (VTS), 2010 Ralph R. Teetor Educational Award from Society of Automotive Engineers, and 2009 Excellence in Teaching Award from IIT. He was the General Chair of the 2013 IEEE Transportation Electrification Conference and Expo (ITEC), Dearborn, MI. He was the Assistant Program Chair of the 2013 IEEE Applied Power Electronic Conference and Expo (APEC), Fort Worth, TX. He was also the Program Chair of the 2011 IEEE Vehicle Power and Propulsion Conference, Chicago, IL and the Program Co-Chair of the 2012 ITEC as well as the Grants and Awards Chair for the 2012-2013 APEC. Khaligh is an editor of IEEE Transactions on Vehicular Technology (TVT) and an associate editor of IEEE Transactions on Transportation Electrification. He was a Guest Editor for the Special Section of IEEE TVT on Sustainable Transportation Systems, a Guest Associate Editor for the Special Issue of IEEE Transactions on Power Electronics on Transportation Electrification and Vehicle Systems, a guest editor for a Special Section of IEEE TVT on Vehicular Energy Storage Systems and also a guest editor for a Special Section of IEEE Transactions on Industrial Electronics on Energy Harvesting. Khaligh is the program chair of the 2015 IEEE Applied Power Electronic Conference and Expo (APEC), the most premier conference in Applied Power Electronics. He is a Distinguished Lecturer of the IEEE Vehicular Technology Society.